A classic murder mystery format from award winning experts. While the comedy & drama unfolds everyone decides who committed the dastardly deeds. Wherever you are based one of our professional local teams will come to you. Our interactive shows offer the chance for guests to play suspects (but no one knows Whodunit). All shows are professionally written by us, tried & tested thousands of times. This means they are packed with jokes and you get a unique story. We bring everything with us. All you need to worry about is having fun - and staying alive. Once your booking is confirmed your event will be managed personally. We are always on hand to help with any questions or requests. We work anywhere in the UK (and abroad). No venue? No problem. We can come to your home or suggest a venue. Whether it's a small dinner party or a large corporate event, we only use experienced professional actors. We understand that there’s only once chance to create a special occasion. Perfect for all ages our events are fun, comedy murder mysteries (we don't provide the food but can suggest catering options & venues). Timings are flexible from 2 - 4 hours. Perfectly formed (8-28): All guests adopt a suspect pseudonym for the night and all take part in the Whodunit. We can even add a few personal details for a special occasion and for extra fun adapt the theme of your choice for the number of men and women in your party. Having it Large (20-50 guests): Hosted by two or four professional actors. Several of your guests play suspect parts while everyone plays detective. No one knows if they are the murderer. Size doesn’t matter (30-100 guests): Hosted by up to six professional actors. Several of your guests play suspect parts while everyone plays detective. Immersive: A flexible format which is a touch of theatre and a Whodunit. No need to have formal dining as the actors circulate the room and scenes are played out to everyone. Guests are encouraged to get involved as much or as little as they wish. Min of four actors. Check out our themes below to find the perfect murder mystery for you. A night to remember (Immersive) - Film director Herbie Hinds' movie is finally going to get made. But Herbie hasn't paid the Mob and they're not happy. Events take a shocking turn resulting in a spectacular finale. This exciting event can be themed: Modern Day, 1930s or 40s Film Noir and can be multi roomed if required. Peak or Blinded? 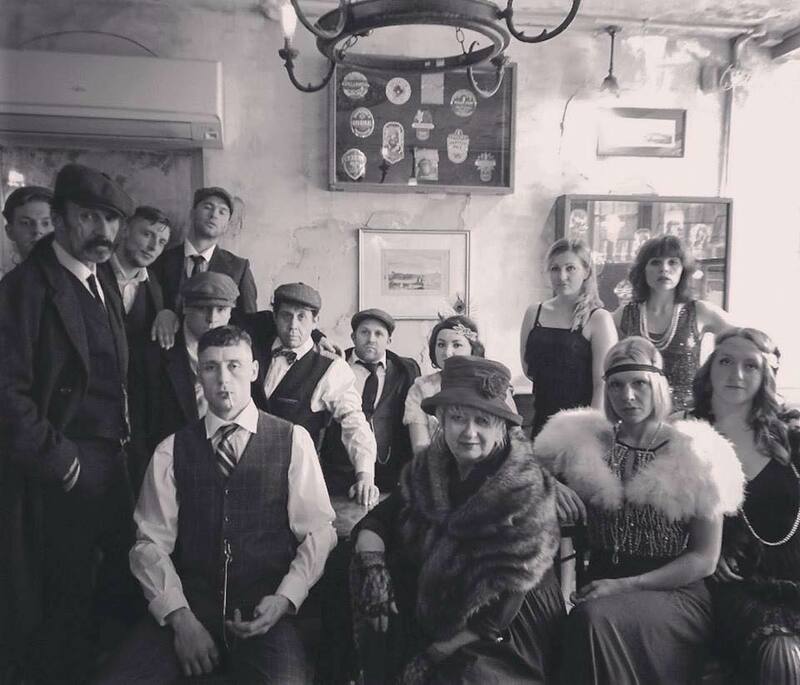 (Immersive)- Peaky Blinders inspired show - It's Derby day. Billy Kimber & Polly Shelby welcomes you to The Garrison for a few drinks and a flutter. Lucious Liver birds Lilly & Milly are performing for the first time. But when news that the Lee's gang has sent someone to ruin the night things get heated. Who fired the gun shot? Who was the target? Who isn't going to be leaving The Garrison alive? Malice in Wonderland: (Immersive) Join us down the rabbit hole for much madness & mayhem. News that that enemy forces want to make Wonderland calm & peaceful does not go down well with The Red Queen who vents her fury at it's leader. The White Rabbit is late to pay his debt and at what costs. Is the Hatter hallucinating or is he really seeing the truth. And where on earth is Alice? Invisible Murder (Immersive): Our murderous staff are among the real waiters, chefs and servers. But your guests won't know who is who. When the Chef reveals that dinner is delayed, a waitress get electrocuted and a guest is ejected for drunken behaviour it becomes clear that all is not quite as it should be. When a murder takes place the real guests need to solve Whodunit and why? As well as the comedy whodunit this event combines elements of cabaret and song. Hen party: Murder mystery - A Taste of Your Own Medicine - Step onto the red carpet with a murder mystery set at the launch of new celebrity magazine - Oi! Guests play celebrity characters. Death & The Maiden Voyage - 1920s. It's cocktail hour as you and your fellow hens set sail on a luxury ocean liner but when the photographer goes missing murder is afoot. We create these comedy events just for you with personalised clues and a script adapted to include personal information about the Bride, Groom and wedding.